I'd be interested in this but what IC is that?? does it use 100K pots? Doh! Yes linear for Blend, log for Volume. I'd better put a note in the post. cool. i haven't started building it yet, but i ntend to in about a week or so. to make it even more versatile, i'd like to add a phase reverse switch for pedals like the Marshall Guv'nor and others that reverse the signal's phase. 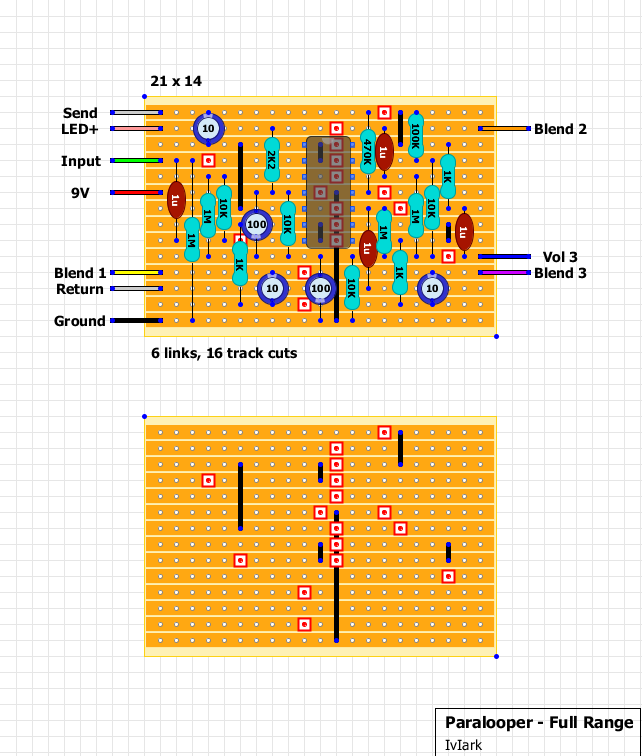 i know that the xotic b.blender and the guitarpcb.com 'paramix' (of which this vero is very similar to), both have phase reverse switches. i'm just wondering how to incorporate one into this vero? If those two changes on the two versions are the only ones, then that should make the full range version switchable to bass version with single 3 pole switch.. Yes if you omit both parts and the link that would be it exactly. The full range version is just supposed to be the same but with that low pass filter removed. Is that possible to also add a indicator LED to the bass/guitar switch? Can I do that using the 3PDT or I will need a 4PDT? Thanks. I need to buy more vero. Once I do that, I'll have a crack at the bass version. This will be useful for my chorus, which does some really nasty things to the low end. Yup. I thought about building this, but couldn't find any use for it... Maybe someday. I'll be getting to it, one of the following days. One question (be prepared, this might be the stupidest question you've ever had); will there be a problem using a 16 pin socket for a 14 pin IC? I will be placing the socket one row up and placing the TL074 according to the layout, so not using the two uppermost socketholes. Make sense? That answer saves me a lot of re ordering. On the other hand... I'm running out of excuses fast... I need to heat that iron. Just put this together and I'm getting nothing but hum. I've uploaded some pics to Photobucket for anyone that cares to take a look. TL074 for IC. 100KA for Volume and 100KB for blend. I have Volume lug 2 on tip. I'm not seeing where I went wrong... Any help would be much appreciated. I'll fix that tomorrow, probably will have to change out that reversed elco? Changed 100u for a new one, right polarity this time. 10u is in. Still nothing. I decided to redo the grounding as it looked a bit raggety. No change. My amp reacts to me touching the guitar strings. But that's about it. Not too hideous is it? I cut between tracks before, during and after soldering. I checked the cuts with a DMM. They were all good. Can you measure the voltages you're getting at all the IC pins. There is always the chance that reversing the polarity has damaged one or more of the other electrolytics but the voltages should give us a clue where the issue is. These lower results @ 3, 10 & 12 are all shakey on the DMM, going up and down. Thanks John, I've cut between row before, during and after soldering. The issues you point at are bent leads (too long perhaps, need better clippers) but I don't believe they short the tracks. I will however run a sawblade through there to make ab-so-lute-ly sure. I did find one short. Desoldered, cleaned up and resoldered the parts. No change. =sigh= I'll just solder in the two tiny links underneath the IC on pins 1&2 and 6&7 shall I? I am now at the point where I'll start a completely new board. I'll probably rebuild it in a week or so. Right now I'm frustrated with myself. Wrong polarity on elco, leaving out another elco, leaving out two links, a short... That's 5 issues in this build... I need to slow down first. Thanks to Mark and John for jumping in right away and offering their assistance. Kudos to you gentlemen, sorry for wasting your time. Next build I promise to take better care. Hi guys, putting this one on the breadboard before committing it to vero. I have some 1uf film caps but they are freaking huge. I want to use electros as I have a healthy supply of 1uf ( polar ), but I'm getting confused as how to work out the polarity from the vero. I'm thinking you knowledgeable ones ( grovel ) might just take one look and be able to tell me which way to put them. Cheers, Buzz. I got essentially the same result as stated above. Amp just responds to me touching the strings. Like a ground noise. I used 470 nf film caps instead of 1 uf on the four appropriate caps, I don't think that would stop it from functioning. I plugged a (known to work} 2N2222 fuzz board into the send/return loop. The 2N2222 fuzz is definitely there, when I turn both knobs up full it makes a horrible strobing noise, just like it did when I had it in a box. The blend knob has no effect on this. No guitar signal whatsoever, but the ground must be attached to react to my fingers touching the strings. I'm going to double check the BB layout tomorrow or sunday. Will post again then. 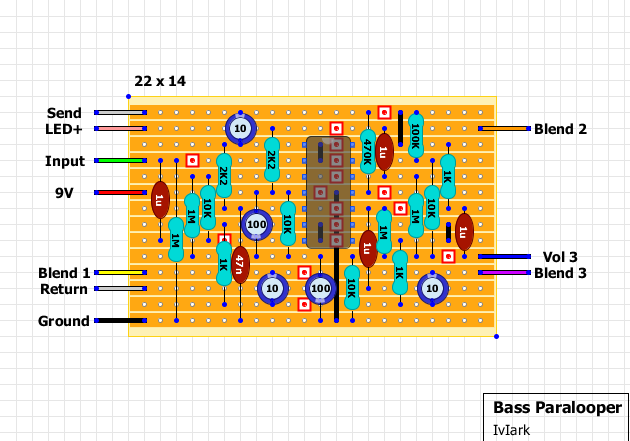 Can't find anything wrong with breadboard layout, maybe the chips I used. 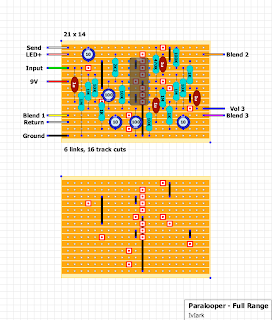 Found a confirmed layout elsewhere with a schematic attached going to go with that. "There is also a low-pass filter (capacitor to ground) on the clean signal that can be switched in for even more low end." Is this low-pass filter actually in this version? I'm not sure what I'm looking for to identify it. I'm interested in a blender with a low-pass. any ideas on how to make it switchable? In the bass version, the 2k2 resistor followed by 47n cap to ground is the low-pass filter. In the full range version, this RC combination is bypassed with a jumper. You can use a DPDT switch to switch between the R-C combo and the jumper. I have built the bass version according to your vero. Works so tag it. I am finding some clipping on stronger attack on the clean signal though. Maybe a charge pump to 18V might help. Has anyone else ever built this successfully? Is there any consensus if it needs 18v or not? Been ages since I've built a pedal. How does the volume pot. wire up? It's combining this circuit with the Eric Johnson fuzz face circuit. Getting ready to build this but had a question. Can someone please verify the value of the Electrolytic caps? Is it in mfds? On all layouts, the electrolytic values are in µF, micro Farads. Thank you mirosol. Could you verify one more thing? The layout shows the electrolytic caps having a grey stripe, is that the negative or positive side? What's the cut of frequency of the lowpass? Could I replace the 2k2 to ground with a (ie 10K) pot to have control over this cutoff frequency? I wanna know too. How to do this? I'm also interested in installing a HPF on the effected (return) path. Hmm, just found this back while researching a lowpassable clean blend .. never built this back then though. I built this last night and it works but it seems to distort the clean signal when engaged. Could this just be the chip? I'm running it after a meathead so I wondered if the input volume could also be affecting it? When i was trying to add a phase inverter to it with LTSpice, I saw that the TL074 have a limited output around 3V with a 0-9V power supply. So if your componants are enought rated you can try a higher Power supply. Or you can try to reduce the output stage gain by decreasing the 100K resistor til it stop clipping. when no expression pedal is connected the signal just passes through to the pot. otherwise, you can use the expression pedal to control your blend. wonder how this would sound ? awesome ! Check this russian fellow ! Now you can actually "fine-tuna" your tone, lol! Hello, thanks for sharing this layout. I made this (with a DPDT to switch between both of them) and works ok, but when the blend pot is min or max I hear noises like whistles, very annoying. Is there a way to avoid this? Is there some bad component?